Wherever there is a thermal gradient, our eyes light up because we can create a heat flow across the gradient and capture some fraction of the energy flow to do useful work. This is called a heat engine, the efficiency of which is capped by the theoretical maximum (Th − Tc)/Th, where “h” and “c” subscripts refer to absolute temperatures of the hot and cold reservoirs, respectively. In the ocean, we are rather limited in how much gradient is available. The surface does not tend to exceed 30°C (303 K), while the depths cannot get much cooler than 0°C (273 K; pressure and salinity allow it to go a few degrees negative). The maximum thermodynamic efficiency therefore tops out at 10%, and in practice we might get half of this in a real application. The general scheme of producing energy from thermal gradients in the ocean is called ocean thermal energy conversion (OTEC). How much energy is available? First of all, water is tremendously efficient at storing thermal energy, packing 4184 Joules per liter per degree (definition of the kilocalorie). Therefore, extracting the heat from a cubic meter of water at 30°C—leaving it at 0°C—represents 125 MJ of energy. Turned into electricity at 5% efficiency, we would need to process 160 cubic meters per second to generate a standard power plant’s output of 1 GW. Remember that we’re using the most extreme temperature difference for our figures. Given that the elevated surface temperatures will only be found in the top 100 m of water (above the thermocline), we must chew through 1.6 m² of ocean area per second to make our gigawatt. In a day, we convert a square patch 370 m on a side. But this doesn’t get at how much can be sustainably recharged. The thermal energy derives, after all, from solar input. In the tropics, we might expect a patch of ocean to receive 250 W/m² of sunlight on average. It takes a square area 9 km on a side to annually recharge the 1 GW draw (at 5% extraction efficiency: the other 95% is dumped into the depths as waste heat at close to 0°C). This figure ignores thermal exchange with the air, which will tend to be in the range of 5–20 W/m² per °C difference between air and water. Also, radiative losses will reach 150 W/m² in clear skies. Approximating these effects to produce a net 100 W/m² retained as heat, we need our annual square to be about 14 km on a side. The 200 km² patch we need to supply a 1 GW “plant” gets multiplied by 13,000 to hit our 13 TW global appetite. That’s an area comparable to the land area of the Indonesian islands: New Guinea, Borneo, Sumatra, etc. (wanted to pick something in warm water to stare at on map). Clearly we have the oceanic space. And as such, we throw OTEC into the “abundant” box. It’s basically a form of solar power at 5% efficiency available over a large fraction of the globe. So no real surprise that it should be abundant. I did not factor in evaporative cooling, which can be rather significant. But it would have a hard time knocking the total resource out of the abundant box. In rough numbers, half of the total solar energy budget reaches the ground, and something like 70% of this is absorbed by oceans, for 35% of the total. Meanwhile, evaporation claims 23% of the solar budget, effectively taking a 2/3 bite out of the thermal energy deposited. So we need something like the area of Australia in the ocean. Like I say—still abundant. Comparing the daily volume/area draw to the recharge area, we compute an interesting timescale: 4 years. In other words, if we isolated a patch of ocean 14 km on a side that could generate 1 GW of OTEC power, it would take 4 years to process the entire volume (above 100 m depth). This is reassuringly longer than the one year recharge time, allowing for seasonal variation and adequate mixing. A look at the map above shows the regions for which our 30°C assumption is valid. These regions tend not to be near the major demand. If we want to park an OTEC plant off the shore of a more temperate location, several things happen. The temperature difference and therefore the quantity of thermal storage obviously shrinks (by roughly factor of two). The thermodynamic efficiency likewise takes a factor of two hit. And the warm layer is shallower at higher latitudes (say a factor of two). The net effect is a factor of 8 greater area of water processing per 1 GW OTEC plant. The area for solar collection likewise increases—by almost a factor of two for reduced insolation, and by an additional factor of two to account for reduced efficiency. Since the energy produced is a quadratic function of ΔT, a temperate OTEC plant becomes seriously impaired in the winter. At 40° latitude off the U.S. coast, I calculate that the winter production is at 40% the summer production in both the Atlantic and Pacific oceans. Operating and maintaining an offshore power plant in seawater, transmitting the power to land, dealing with storms and other mishaps are serious challenges. OTEC reduces to a low efficiency, operationally difficult method for harvesting solar thermal energy. It seems we would be better off getting 15% in solar thermal plants in sunny areas. I’m not sure why we’d waste our time on OTEC when there are better (cheaper) ways to collect the abundant energy of the Sun. OTEC has some advantage in not having to build the collector, and in the fluid delivery system, but this would seem to be a minor plus stacked against the operational disadvantages. OTEC deserves a spot in the abundant box, but practicalities limit its likely role. Much as tuna was once marketed as the “chicken of the sea,” ocean currents are the “wind energy of the sea.” Recalling that the kinetic power in a fluid flow is ½ρAv³, where ρ is the density of the fluid, A is the area described by the collecting rotor, and v is the velocity of the fluid, we note that the density of water is about 800 times that of air. Big score! But the velocity tends to be smaller, and has a cubic power to knock it back. A strong mid-ocean current might reach 2 knots, or 1 m/s. Compared to a wind speed of 10 m/s (22 m.p.h. ), we get 1000 times less power per rotor area. So we’re right back to where we were with wind. We have a lot more ocean area than land area. And we are not as constrained in the ocean as we are on land to keep our turbines near the surface, so we could exploit more vertical space—to a point. Ocean currents tend to be confined to the upper 400 meters of water, so the depth gain is only a factor of 2–3 times what we access for wind. On the plus side, we note that ocean currents are far more steady/robust, so we would not be plagued by intermittency the way we are with solar and wind. On balance, wind fell into the “potent” box, so ocean currents surely deserve at least this rating—practicalities aside, of course. We would naturally first want to exploit pinch-points (straits, narrow inlets, etc. ), where currents may be up to 5 m/s, now delivering 100 times the power per area compared to a windmill at 10 m/s. But currents tend to be large in these pinch points due to tidal fluctuations, not steady flow, so we’re just tapping into the tidal energy budget—previously characterized as a niche source. To the extent that steady-current pinch points exist, they make a natural choice for locating underwater turbines, but such places are limited—especially in terms of area or they would not be “pinch” points—so the total power available is small. We saw that a given rotor area will deliver comparable power whether placed in open ocean currents or on land in a moderate wind. Now I ask you: is it easier/cheaper to put a giant turbine on land, or upside-down at sea? Think about access for maintenance, salt water corrosion, transmission of electric power, all the bruised fish, etc. Most of us have marveled at the awesome power of waves crashing into a beach, pier, or headland. It’s enough to knock us over, unlike solar or wind power. And all that coastline—surely it’s a winner! Waves represent third-string solar energy: solar energy is absorbed by land and sea, making thermal gradients in the air that generate wind. Wind then pushes on the surface of water, building up waves. The wind-wave interaction is self-reinforcing: the higher a wave sticks up, the more energy the wind can dump into it. Many of the waves arriving on a coastline were generated in storms somewhere across the ocean. The Earth absorbs about 120,000 TW of solar energy (that which isn’t directly reflected). About 1% of this ends up being dissipated in winds (1200 TW). Of this, about 5% (60 TW) goes into wave generation. Some of this fights itself (wind against wave), some wave energy dissipates on its own via viscosity and turbulence, and some gets eaten up in shallow waters (e.g., around archipelagos) without making landfall. All of these chip away at the amount of wave energy accessible near land. I might venture a guess that we receive something comparable to our 13 TW global demand on our shores. I want to satisfy myself with a ground-up estimate to see if the numbers make sense. Let’s say a 2 m-high wave (trough to crest) arrives every ten seconds, traveling at a jogging speed of 3 m/s. The waves are therefore 30 m apart. Each meter of wave-front then has a volume of about 30 cubic meters (average height is 1 m above the trough for a sinusoidal shape). The gravitational potential energy, mgh, above the trough comes to 225 kJ, and the kinetic energy, ½mv², is 135 kJ. If we were able to capture all of this energy, we would collect 360 kJ every 10 seconds, or 36 kW of power for each meter of coastline. Compared to solar or wind power density—at approximately 200 and 30 W/m², respectively—this sounds like a huge number: 36,000 W/m. But the fact that the denominator is linear in length and not a square makes a gigantic difference. The Earth has far more square meters than linear meters of coastline. Happily, my figure compares well with values you can find by searching for “wave energy potential map” in Google. A 2000 km coastline might therefore net 70 GW if one could catch all the energy at 100% efficiency. The lower-48 in the U.S. might then collect something like 200 GW of wave power to the chagrin of surfers, representing something like 7% of the total domestic power demand. A very recent report puts the wave energy off California’s 1800 km coastline at 140 TWh per year, working out to an average of 16 GW—coming in a good deal less than my stupid calculation. The full report for the U.S. cites a total available continental shelf wave energy for the lower 48 states as 910 TWh per year, amounting to 104 GW of continuous power. But only about half of this is deemed to be recoverable, totaling 54 GW. This puts it in the same ballpark as hydroelectric, if fully developed across our continental shelves. Using my 35 kW/m number for a global calculation, I will make the crude estimate that there is enough coastline to circle the globe twice—considering that not all coastline faces the prevailing swell and is therefore penalized. Whatever. This makes for 80,000 km of coastline, delivering 2.8 TW—or about 20% of global demand, if fully developed. A quick Google search shows estimates of global wave power of 2 TW, 3.5 TW, 1–10 TW: all roughly consistent with my crude estimate. The numbers push me into putting wave energy in the “niche” box, since my criterion for “potent” is the ability to satisfy a quarter of our need if fully developed. It might possibly qualify as potent, but it’s borderline. Where did the 60 TW of total dissipation into wave energy go? A bit of digging suggests that half is lost in deep-water breaking (think of the “roaring 50’s” in the southern hemisphere). The rest is lost in wave-turbulence interaction and bottom friction. It would seem that there is greater inefficiency than I appreciated in delivering wave energy to land. Each of the three energy resources we’ve discussed here require placement of energy conversion equipment into the sea. I’ve seen what sunken ships look like even after a few decades. They’re beautiful in one sense—teeming with colorful life—but not so much if functionality is more important. I cringe to think of the maintenance costs of our energy infrastructure placed out to sea. The ocean covers 72% of the Earth’s area, absorbing vast amounts of solar energy as heat, moving around the globe in great conveyor belts, and capturing some fraction of wind energy in its waves. Ocean thermal earns a spot in the abundant box, ocean currents easily meet the potent criterion—being greater than wind potential, while waves fall short into the niche box. All three forms of ocean energy just add to the pile of alternative methods for creating electricity, being useless for heat or directly as transportation fuel. Furthermore, only wave energy is conveniently delivered to our shores. Practically speaking, scaling facilities to capture ocean thermal and ocean current energy crosses a line of practicality that we are unlikely to exceed as long as other large-scale energy options (solar photovoltaics, solar thermal, wind, nuclear) remain more convenient. And yes, for all its complication, I would still guess nuclear to be easier to accomplish at scale than the ocean technologies. Anything on land gets an immediate boost in my book. In this sense, ocean energy—much like solar energy in space, or pools of methane on Titan—falls into more of a “so what” category for me. Sure, it’s there, and I’m pleased to say it is even abundant. But practicalities will likely preclude us from pursuing it in a big way—at least in the near term when we face our great transition from fossil fuels. Wave energy is slightly less impractical, but the widely varying technologies I have seen demonstrated strike me as no more than cute, given the puny amount of power available in total. So as I cast about looking for reasons why I should not worry about our energy future, I find little solace when I look to the sea. We’ll see nuclear fusion next week. No, really. 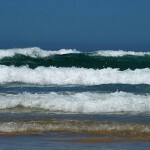 This entry was posted in Energy, Energy Scale and tagged oceanic-energy, OTEC, wave-energy by tmurphy. Bookmark the permalink. Shouldn’t be multiplied by 13.000? OMG what a big blunder! Thanks for the catch! Forget comparisons to New Zealand land area: I’ve upgraded accordingly. Thank you for another great analysis. I myself don’t have very high hopes for any types of energy production that rely on the ocean. Not only do you have the maintenance aspects that you mentioned, but the one even remotely practical type is tidal energy which would probably be ruled out by the value of the land near the coast. I can’t speak for other countries, but in the United States any coastal land in the lower 48 is sold at a great premium. Many cities along the coast rely on the beaches for tourism so they would never risk their main source of income by putting up tidal collectors or similar solutions. I’ll second that. I live near 20km away from one of the best tidal rapids in the world – the Skookumchuk Rapids in British Columbia, Canada. On a 3m tidal change, there is about 0.8 billion cu.m of water exchanged – four times a day! To do a Tom style calculation, if you could extract even half that potential energy, it would amount to a constant output of 280MW. But you would have to block the entire channel to do so. At peak tide the waves are big enough that kayakers surf them. Not surprisingly, this is a major tourist attraction (and also an ancient native site) . The higher the tidal fluctuations and currents, the more the areas are valued for their natural beauty. Continuing the them of this blog, it is possible we will see fusion power before we see sites like this get developed. This seems a pointless drumbeat. Nothing besides solar thermal or geothermal is going to generate heat directly, and nothing is going to make transportation fuel directly. The long term industrial future is electrified, possibly supplemented by synfuels. Not so fast. Over 90% of our energy sources today primarily produce high-grade heat that we use to make electricity. Cogeneration makes use of the heat. If motivated, we could pipe wate heat for use in heating homes/offices. Biofuels and possibly artificial photosynthesis will make liquid fuels directly. It is a drumbeat of mine, no doubt. But I don’t see it as pointless, just reinforcing a point. Didn’t you already find biofuels likely won’t be making liquid fuel in the quantities the US currently uses them? I forget. It’s still worth pointing out what the inherent capabilities of different sources of energy are—whether we use them in that capacity or not. And yes, biofuels will have a hard time covering our demand, but we should still call attention to its special status of being a liquid fuel straight-off. This suggests that you should do a post soon about the potential for using biofuels for meeting our liquid fuel demands. Ignoring the energy demands (assume that we can get infinite energy from solar, fission, fusion or whatever) would it be possible to make enough biofuel to keep everyone driving like they are now? See the post on biofuels. I wonder if that might be worth a look? Somewhat surprisingly, the oldest continuously operating district heating system in the world is in Denver, Colorado. When I worked for the state legislature, I had an opportunity to go down and visit some of the old steam and coal tunnels that interconnect several of the oldest state government buildings. A bit unnerving when you’re in a dirt-floored, brick arch tunnel and think about what’s above you. But neat to see tracks for the hand-pushed cars that were used to distribute coal 100+ years ago alongside contemporary fiber optic runs. Thanks for the analysis. On the topic of oceanic thermal energy, we have designed and are now building a little public aquarium on the west coast that sits overtop the beach on pilings and has sea water pumps sending raw sea water straight up from the dock into the exhibits, from where it overflows right back to the ocean. But we will collect this outflowing water in a concrete tank under the building before it goes out and use this to run a heat pump to heat the building. I figure we should get a COP of 4 to 1. The heat transfer goes through some titanium plates. As you mention, one of the issues we must design around is encrusting marine growth, especially inside the pipes with water movement. This is perfect habitat for filter feeders, we have even had full sized barnacles growing on the pump impellers! The way we get around this is to have two complete independent parallel lines and alternate them every two weeks, so that one goes stagnant and kills the growth. There is a considerable amount of design and complications that need to go into undersea equipment. But I think for coastal cities they could use the adjacent ocean to a greater extent to get heat. Even in the Great Lakes they have Zebra Mussels. Regarding underwater turbines, I’d be really worried about chopping up whales. There are now so few whales left that if we flubbed up and ended up chopping them up with a poorly placed turbine then a simple design mistake like that could wipe out entire populations. And how would you know until you try it? By then it’s too late. I think OTEC might have a large ecological impact as well. Changing the water temperature, even slightly, might seriously disrupt sea life. The ocean’s been getting significantly warmer over the decades. Almost all that accumulated heat from global warming goes into the ocean, not the atmosphere. The atmosphere is the catcher of the heat; the ocean is the depository. The ocean off Miami Beach droops off very steeply. I wonder if you could pump up the cold water from the deep and use it for air conditioning, either directly or as a heat sink for the air conditioner condensers. Tom – it’s good to have your accounts of OTEC and marine currents, but I suspect you’re missing most of the wave energy resource via the assumption that it is only available at the coasts. Consider a fleet of wave energy vessels moored say 20 miles offshore. (And others at 30 mls, 40 mls, 50mls etc) They receive waves from any direction, not just from seaward, since even 2 miles of open water is enough to provide 2 metre waves under a stiff breeze. Then consider that there will be minimum shading effect if they are well enough spaced out for waves to ‘infill’ used sections along their length. 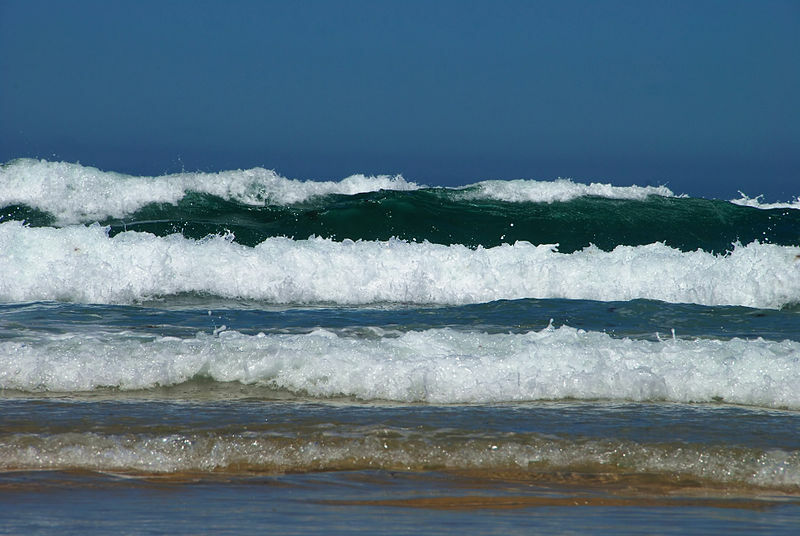 Then consider the size of waves that are pretty normal in some of the seas around industrialised nations – in the Western Approaches off the UK, 4 to 5 metre hight is quite normal, and storm waves go up to 10 and 12 quite commonly. Then consider the horizontal rotor device produced at the US Naval Engineering Academy at Charleston, which on its first wave-tank run reportedly converted 95% of the waves’ energy. After some adjustment of its foils, it then converted 99% and nullified the waves, with which the staff designing it were well satisfied. If these options formed the basis of the evaluation, I’m confident that you’d choose the ‘potent’ box for wave energy for power supply. Next, if you’d suspend the normal search for electricity, consider the waves available year round in the roaring fourties, but not from the perspecitve of power supply as there is little local demand. Instead, George Olah’s work on the Methanol Economy becomes relevant. [For those who haven’t heard of him, he’s a Nobel laureate in Chemistry]. His thesis was that massive hydro-power sites (in remote northern Canada) should be developed with the role of providing power for methanol production (CH3OH) using carbon from airborne CO2 and hydrogen & oxygen from water. IIRC he projected a break-even price per unit of petrol-equivalent methanol a bit lower than current oil prices. – Using the relatively small infrastructure of wave energy vessels on the immense energy field of the Southern Ocean to power this process might well improve the $ economics significantly, let alone the carbon efficiency. And we really are going to be terribly short of liquid fuels . . . . . I just want to offset this rosy picture with the recent DoE study that California’s coast could provide 16 GW of power, which came in substantially lower than my estimate of 54 GW (1800 km times 30 kW/m). So yes, this is still coastline, but it gives me pause that my “niche” assessment is likely an overestimate. Plus, I hesitate to accept the notion that moving far offshore changes the story substantially, since we’re not dealing with an area phenomenon, and the waves landing on the coastline were simply delivered from farther out. The waves that arrive on the coastline tend not to have been developed locally (in the local 2 miles of water), but are transported across oceans. There are some pretty exciting OTEC happenings I wanted to make sure everyone was aware of. The Bahamas is committed to building 2 commercial OTEC plants with an American company. Not only are the Bahamians tired of spending enormous fossil fuel costs, but the OTEC plants will a source of clean drinking water. Truly revolutionary technology. Also, to those concerned about environmental effects because of temps…. the water pumped back into the ocean is done a depth of equal temperature. So there is no change in the temps of the overall surrounding ocean. It’s obviously crucial that the plant not change the temp of the water in order to keep the OTEC system working. Unlike nuclear which must have a nearby water source to cool the plant, and ruins the water source by drastically raising temps. The best and only way to weather the convergence of peak resources and life threatening environmental degradation is a much slower lifestyle akin to the middle ages per capita use. Solar, wind, ocean power and thermal gradient energy capturing devices are not alternative energy sources. They are extensions of the fossil fuel supply system. There is an illusion of looking at the trees and not the forest in the “Renewable” energy world. Not seeing the systems, machineries, fossil fuel uses and environmental degradation that create the devices to capture the sun, wind and biofuels allows myopia and false claims of renewable, clean, green and sustainable. Energy Return on Energy Invested (ERoEI) is only a part of the equation. There is a massive infrastructure of mining, processing, manufacturing, fabricating, installation, transportation and the associated environmental assaults. Each of these processes and machines may only add a miniscule amount of energy to the final component of solar or wind devices. There would be no devices with out this infrastructure. What would be the potential engineered solution to extracting energy from water at 30c to water at 0c. Maybe a ammonia cycle or an organic compound. The Ammonia cycle has been made to work with 70c water but using a Arctic/Mountain air cold sink at typically -10c or cooler. Even at this greater differential Ammonia turbines rarely exceed efficiencies of 5%. I suspect the real world performance of a 30c gradient would be in the sub 1% range. Even at 5% efficiency, parasitic loads always threaten to overwhelm the payout. For instance pumping, 160 tonnes of water from 5000 feet down could easily prove catastrophic to efficiency. Even if we ignore the potential energy losses, just the losses from kinetic energy imparted, friction losses, impeller efficiency, filtration pressure losses, etc would eat you alive. I’d say 30c temperature gradient is nonviable with present human technology. Even 70c is touch and go. Also unless you place your power plant at 5000 feet of depth the cold sink has to pumped up. So in effect your temperature differential will be even less. Say you commit to unbalanced pumping of 5 times more cold sink water, even in a perfect heat exchange your temperature differential will only be 24c now. The fact that you are now committed to pumping 160×6=960 tonnes of water a minute makes the entire operation questionable. Of course you can put a high density fluid heat exchanger in the cold side but the fluid required will remain much higher. Such a fluid would also increase friction. As I said beyond human technology, probably for ever. There are ‘reasonable’ solutions the problem of extracting energy from a 30degree temperature gradient – thermoelectrics will work, as would low temp stirling engines. The problem is the cost of these solutions at these very low power densities… and supplying a sufficient quantity of cold water at sufficiently low loss (and cost). I don’t think it’s likely to be technically impossible (960 tonnes/min = 16m^3/s = 0.5 m/s through a 3m diameter pipe)… but it means you need a well insulated pipe (at 0.5m/s it takes about an hour for the cold water to get to the top) and that’s more like a freaking tunnel than a pipe (though you don’t need to support a pressure gradient). The cost of that, plus the cost of the low temp conversion systems compared to similar systems running of high temperature differentials from, for example, the sun, seems pretty unlikely to be a winner. I’m pretty sure you could get net energy out during operation though. I have committed an error. That should be 960 tonnes per second! Or ~ 60,000 tonnes per minute. or ~ 3.6 million tonnes per hour. Or 72 Million tonnes of water per 20 hour operational day. You would need much more massive pipes. The various OTEC installations that exist are functionning with a 20°C gradient (25°C surface, 5°C deep ocean), just have a look at OTEC wiki pages for links. OTEC is within reach of technology decades ago but is an economical dead end, like any alternative and subsidized energy. Yes, I have seen those reports but they were all extraordinarily simplistic ‘experiment’ type plants. I think on this blog on the energy cycle must be commercially viable with human technology. – none of them have tried a reasonable filtration system to remove contaminants and the bio load. – None of them made sure to pump the cold sink and cooled fluid back down to the depths a good distance from the intake to prevent fouling. Probably several miles away. Surface cold discharge will never be acceptable. Such pumping would be a challenge even in a closed cycle. – They did not have a reasonable handle on the pumping it takes to move 960 tonnes of water per second. Just reasonably fast pumping will heat up the water from friction, the Alaska oil pipeline is kept liquid this way. – BTW this is the equivalent of pumping 40,000 Cubic feet of water. Or the Colorado river in High flood. Pumping this water at 0.5 m/s-1 to avoid friction losses would be quite the trick. On the order of 2000 sq meters of pipe cross section. Half an Acre. – Insulating the cold water from a warm tropical environment is non-trivial. – They never had to account for maintenance which typically consumes a non trivial fraction of energy. Like I said probably beyond human technology. Now that I consider the math, well beyond human technology. Two thoughts pop up on reading that last sentence. 1. given the current fossil fuel energy sources are also subsidized, does that also make them a dead end? 2. when there are no more fossil fuels, the alternatives become mainstream and the economy will (be forced to) change to reflect the new reality. Even if any one technology is shown to be non-viable, dismissing all possible alternatives out of hand just because they are alternative seems a bit strange. OTEC is featured in Marshall Savage’s book The Millennial Project. He advocated building ocean colonies around OTEC plants, which provide power, flotation (due to the large chamber), and distilled water. They also help with food production. Natural fisheries occur where ocean currents bring up rich organic material from the ocean floor, fertilizing the surface. OTEC does the same thing. And of course, using the power locally does away with the problem of transmitting power to land. It could also help with construction. Rather than haul all the materials for a large colony out to the site, Savage advocated using biorock, which uses electricity to accrete minerals from seawater. You end up with something like coral.